On Wednesday November 28th I was invited to attend a special event entitled “Ikebana Floral Extravaganza”. The highlight was the visit of and a demonstration by renowned Ikebana artist Tetsunori Kawana from the Sogetsu school of Ikebana. Although I have read about Ikebana I have never seen it demonstrated in person so this event was a great opportunity for me to broaden my knowledge about Japanese culture. I learned a lot about the history of Ikebana in Jamaica since it’s introduction in the late 1960’s. We all were introduced to the new Japanese Ambassador to Jamaica – Yasuo Takase. He is Japan’s 7th Ambassador of Japan to Jamaica. He spoke about how honoured he was to be in Jamaica during our 50th year of Independence celebrations and reminded us that come 2014 it will be 50 years since Jamaica and Japan established formal diplomatic relations. It was a great event that helped me to rekindle by love of Japanese culture at a local event as well as catch up with some old friends and meet new ones. Thank you for coming to the Ikebana demonstration. I’m glad you liked it! 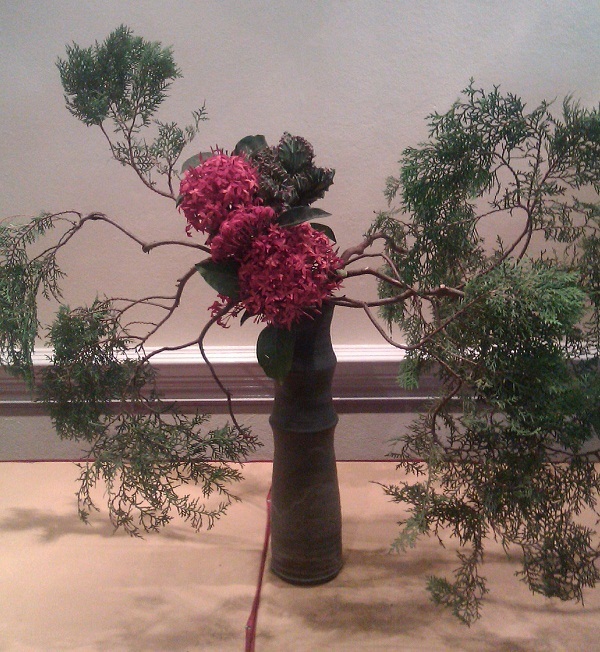 I was also proud of what Ikebana can do. Thank you for your comment Kaori-san. I look forward to attending and covering more events while learning about Japan!